If you are wearing sunglasses that truly match your complexion, hair style and face cuts, they will add up to the attraction of your face big time. It won’t be surprising if people ask you about those glasses or make a comment. If those glasses are from a globally famous brand such as Armani, you would love to tell everyone that you are wearing Armani sunglasses. However, if someone who is smart enough points out that you are wearing fake Armani sunglasses this may prove to be something embarrassing. Perhaps not, if you are aware of it yourself but if you have ended up buying expensive sunglasses that are fake, you have actually wasted your money. Hence, while buying Armani Sun Glasses there are a few things that you must keep in mind. First of all check the price. If you are happy to see that price is low, then they are not original Armani glasses. 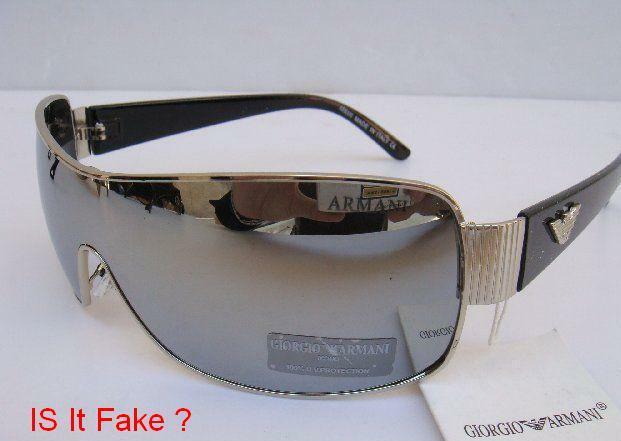 It is advised to shop for Armani Sunglasses on line from websites, which sell authentic products. Look at the casing and the cleaning cloth as you get these additional items when buying branded sunglasses. There should be Armani logo on all of them appearing hard and clear, instead of gritty or crooked. If you are buying Armani sunglasses from an individual seller then he may not be providing you the cleaning cloth or the casing. If your examine the style, it will be quite exclusive for original Armani sunglasses being sleek and smooth with curved, tortoise and aviator-style frames. The original Armani sunglasses will be tinted in colors like blue, brown or plum with the Armani logo and made in Italy crafted finely. The same may appear crooked or missing if the glasses are fake. Remember to check the model number which will be same for each pair of Armani sunglasses and verify it online. Find the certificate of authenticity against the model number and ask the seller to provide you. If there is no certificate of authenticity the glasses are not original.